tcanabrava committed R231:10db899f14ee: Add override to clean up warnings (authored by laysrodrigues). tcanabrava committed R231:2227f9a1cb9f: Add override to clean up warnings (authored by laysrodrigues). tcanabrava closed D19085: Add override to clean up warnings. tcanabrava committed R649:7c0b056607a2: Turning on the rotation on 3D plot (authored by karinapassos). tcanabrava closed D19627: Turning on the rotation on 3D plot . tcanabrava committed R323:1af7c48a2df4: Deprecating rotation function (authored by karinapassos). tcanabrava closed D19645: Deprecating rotation function. 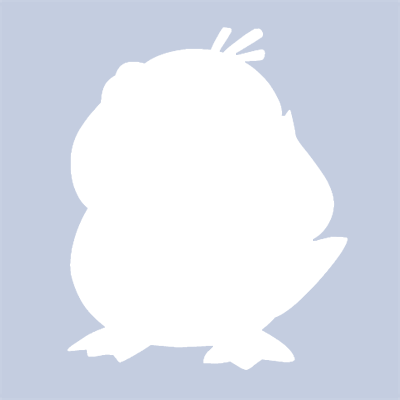 tcanabrava added a comment to D16138: Create the default profile if it doesn't exist. broken, so this patch makes sense to me. tcanabrava updated subscribers of D20395: Ctrl-Tab should work in "split-only" view as well. 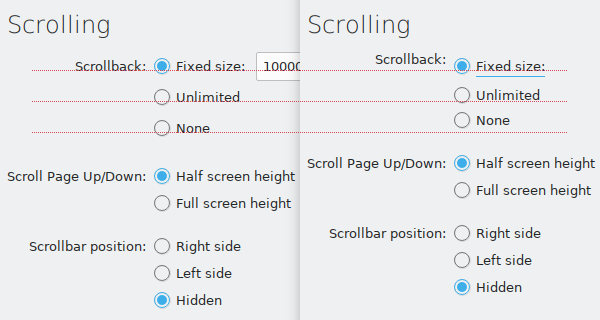 tcanabrava added a comment to D20466: Rework scrollback settings. After thinking about scrollback a bit more I think history file path AND scrollback size should go to global settings. Does anyone use different profiles with different history sizes, or change size just for current session? Did you mean -1? :P Hiding part of an UI depending on selected option is bad UX. Moving another elements around because something appears is probably even worse. Maybe kmessagebox instead of label? Ok, I'll update the code for that. tcanabrava updated the diff for D20466: Rework scrollback settings. me this is one of those niche cases that shouldn’t exist. tcanabrava updated subscribers of D20466: Rework scrollback settings. cares where this is being stored”? tcanabrava added reviewers for D20466: Rework scrollback settings: Konsole, hindenburg. tcanabrava updated the summary of D20466: Rework scrollback settings. tcanabrava requested review of D20466: Rework scrollback settings. tcanabrava committed R319:e1474c3bc949: remove clang warnings: else after return (authored by tcanabrava). tcanabrava closed D20444: remove clang warnings: else after return. tcanabrava closed D20441: Fix clang warnings about else after return. tcanabrava committed R319:13781fa6c9b6: Fix clang warnings about else after return (authored by tcanabrava). tcanabrava committed R319:208218dec98a: Small code simplifications (authored by tcanabrava). tcanabrava closed D20438: Small code simplifications. tcanabrava updated subscribers of D20438: Small code simplifications. need to change that return. tcanabrava added reviewers for D20444: remove clang warnings: else after return: Konsole, hindenburg. tcanabrava requested review of D20444: remove clang warnings: else after return. tcanabrava added reviewers for D20441: Fix clang warnings about else after return: Konsole, hindenburg. tcanabrava requested review of D20441: Fix clang warnings about else after return. tcanabrava added reviewers for D20440: Fix warning "variable loses precision int to uint8": hindenburg, Konsole. tcanabrava requested review of D20440: Fix warning "variable loses precision int to uint8". tcanabrava requested review of D20439: Fix alignment boundary. tcanabrava added reviewers for D20438: Small code simplifications: Konsole, hindenburg. tcanabrava requested review of D20438: Small code simplifications. tcanabrava added a comment to D14200: Simplify newSession code. tcanabrava updated subscribers of D14200: Simplify newSession code. tcanabrava added a comment to D15570: Use new connection style. I forgot this for quite a while, I'll update today. tcanabrava added a comment to D20115: Re enable move tab left / right via keyboard shortcuts. ON master w/o this patch, I still get the CD echoing on all the tabs when I try the shortcuts. So maybe it is something else. Is anyone else seeing this issue? tcanabrava added a comment to D13854: Refactor Profile and ColorScheme. I'll add a backtrace as soon as I test this again. since I'm succeeding in my konsole code cleanup I'll get this back on track. tcanabrava committed R319:8029d74a970f: Implement saving sessions recursively (authored by tcanabrava). tcanabrava closed D20224: Implement saving sessions recursively. tcanabrava closed D20410: Display the settings as List instead of Tab. tcanabrava committed R319:7bda99d7bc4e: Display the settings as List instead of Tab (authored by tcanabrava). tcanabrava added a comment to D20410: Display the settings as List instead of Tab. tcanabrava added reviewers for D20410: Display the settings as List instead of Tab: Konsole, hindenburg, ngraham. tcanabrava requested review of D20410: Display the settings as List instead of Tab. tcanabrava added a comment to D20398: Remove warning: do not use 'else' after 'return'. tcanabrava updated the diff for D14200: Simplify newSession code. tcanabrava added a comment to D20395: Ctrl-Tab should work in "split-only" view as well. When we have multiple tabs / splits this is not confusing? this should fix most of the issues. I have another patch to go related to actions, but this one needs to land first. tcanabrava updated the diff for D20115: Re enable move tab left / right via keyboard shortcuts. tcanabrava added a comment to D20224: Implement saving sessions recursively. tcanabrava updated the diff for D20224: Implement saving sessions recursively. tcanabrava added inline comments to D20224: Implement saving sessions recursively. tcanabrava added a comment to D18992: Kbruch exercise mode improvement. tcanabrava accepted D19085: Add override to clean up warnings. tcanabrava added a comment to D19960: bluez-qt: remove warnings. tcanabrava accepted D19563: adding multiple decays and updated isotope information H-Na. tcanabrava requested changes to D20119: clean main.cpp. the adition of the phabricator configuration file is unrelated to a clean, please split in two patches. tcanabrava requested changes to D20258: clean. tcanabrava added a comment to D20335: Remove warning static member accessed through instance. tcanabrava accepted D20322: remove the OpenMPI dependency. true, but then the instance is there anyway. what we gain from this? Hm? This doesn’t touches that. This seems to fix the issue I started having recently where Konsole crashes at logout and then opens as a big white window on login after session restoration. tcanabrava accepted D20336: Simplifying class constructor with constructor delegate. sorry, my mistake. this is correct. tcanabrava added a comment to D20336: Simplifying class constructor with constructor delegate. that looks factually wrong. what are you trying to accomplish here? tcanabrava updated the test plan for D20224: Implement saving sessions recursively. tcanabrava added a reviewer for D20224: Implement saving sessions recursively: ngraham. This code can load sessions, it has a better behavior than the old session load code, but still has bugs. I'll finish this luckly today / tomorrow. I'll remove the debugs / message handlers as soon as everything is working. but it's one of the fastest ways for me to keep the debug messages between runs so I can understand what's wrong. the session is correctly saved, and the SessionManager correctly loads all the sessions back, the ViewManager however is broken on load. that's what I'm debugging now. so even tougth we don't display any terminal, they are up and running. when MainWindow::saveProperties is triggered we already destroyed the sessions and tabs, and that's the reason it's not saving anything. I'm trying to debug the destructor order now to see if I can change something. tcanabrava added reviewers for D20224: Implement saving sessions recursively: Konsole, hindenburg. tcanabrava requested review of D20224: Implement saving sessions recursively. tcanabrava added a comment to D17643: Multiple Splits per Tab. tcanabrava added reviewers for D20115: Re enable move tab left / right via keyboard shortcuts: Konsole, hindenburg. tcanabrava requested review of D20115: Re enable move tab left / right via keyboard shortcuts. tcanabrava added a comment to D18154: Add a "Session Switcher" via Ctrl + Tab. This is mostly working, but I will not merge this untill we fix the current state of the shortcuts (that I'm preparing in a separate patch). after the shortcuts are correct, there will be a follow up patch here to use the switcher style *or* the next-prev-tab style (as we have today) selectable by the user, defaulting to the current behavior. tcanabrava updated the diff for D18154: Add a "Session Switcher" via Ctrl + Tab. I’m in a konsole spree this week so expect patches. how that the splits are merged, I'm preparing a round of patches that where rotting in my pc. tcanabrava abandoned D18575: Remove warning before hidding the MenuBar. tcanabrava abandoned D19015: This is a followup review for the removal of ifdefs before debug. tcanabrava added a reviewer for D20088: Simplify TerminalDisplay code : Konsole. tcanabrava abandoned D20089: Remove sender() and QVariant() conversions. tcanabrava accepted D20036: Correct math to blend color in the blur effect. tcanabrava abandoned D20090: Declare + initialize, instead of setting the value later. tcanabrava updated the diff for D20088: Simplify TerminalDisplay code . Use one liners where appropriate.